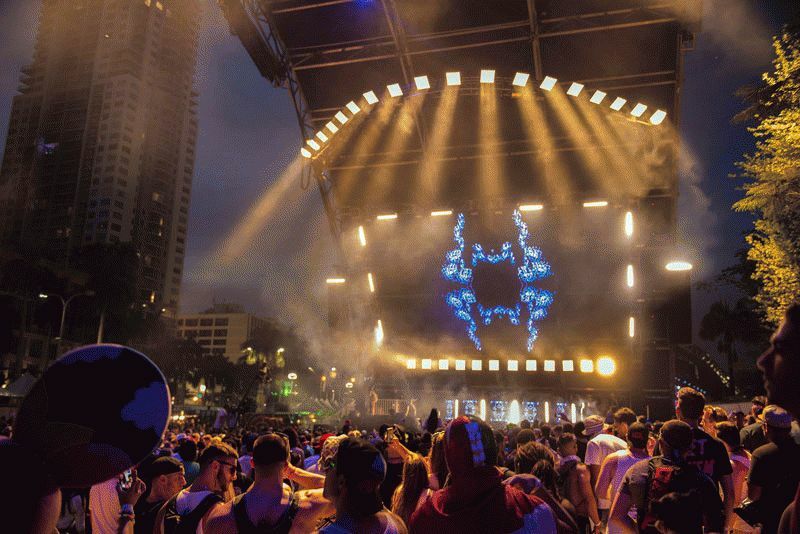 All eyes were on the Worldwide Stage at the Ultra Music Festival, and why not? With a superstar studded lineup of the crème de la crème of the EDM world performing, plus a surprise two-song appearance by Ariana Grande, the thousands of fans at the Worldwide Stage pavilion were transfixed by the scene on stage. This year, the awestruck crowd did more than look at the stage, they had their collective vision funneled into it, thanks to a commanding lighting and truss design by Steve Lieberman of SJ Lighting. Lieberman’s design concept was developed around a massive double winged truss structure that resembled an arched bridge. The abutment at one end of this bridge started at the edge of the concert pavilion; the other end was anchored behind the stage itself. This end of the bridge ran across the entire 60-foot width of the stage. A line of 12 intense Nexus Aw 7x7 warm white LED panels from CHAUVET Professional ran across the structure behind the DJ booth. Overhead were 36 additional Nexus Aw 7x7 panels on two curved rows at the base of the bridge arch that sloped toward the stage.